From our study, 90% of hydraulic component failure can be traced to hydraulic oil problems (such as using old oil, contamination etc.) . Hitachi genuine hydraulic (46HN) oil is specially designed for use in our equipment. It will keep your equipment functioning at peak levels, will protect hydraulic components from wear, and will reduce your oil cost, thanks to its long life (4,000 hours*). *If not mixed with other brands. We designed our equipment, and that’s why we can develop the hydraulic oil that best matches it. 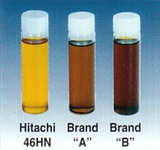 Listed below are the features of Hitachi genuine hydraulic oil. 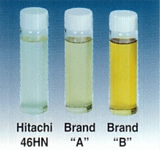 Most Hitachi equipment comes with our genuine hydraulic oil when shipped from the factory. You should continue to use Hitachi genuine hydraulic oil to get maximum performance from your equipment, and also to reduce your hydraulic oil cost. Test: Millipore filter test performed on oil sample taken from Indiana Stirring Oxidation Test (ISOT). ISOT: 165.5C, 1,300rpm, with Fe/Cu catalyst. Millipore filter: mg contaminant/100ml solvent from a 0.8 micron filter.